The results are coming in from the Texas county conventions. Early results tallied by The Associated Press showed that Clinton had 301 delegates, or 60 percent, compared to Obama's 202 delegates, or 40 percent. That's out of about 7,300 delegates expected to be selected at about 280 county and senate district meetings across the state Saturday. The major metropolitan areas which should go heavily for Obama aren't in yet. There were a few surprises. At the Travis County Senate District 25, after a credentials committee heard complaints, 12 Obama delegates were removed and two Clinton delegates were removed. In Webb County on the Texas-Mexico border, where Laredo is located, Clinton surprisingly swept all 51 delegates because Obama did not meet the 15 percent threshold of caucus support. Burnt Orange is tracking the results as they come in. As of 5:45 CT, only 19% of the vote is in. It's going to be a long night. Hillary Clinton's campaign received 2,000 complaints from Texas voters about the states' caucuses. Her campaign asked Texas to double-check the signatures to make sure those who participated were entitled to do so. Today, the Texas Democratic Party refused her request. Hillary won the primary vote but with 41% of caucus results counted, Obama led 56 percent to 44 percent. "Our campaign agrees that the best way to capitalize on the incredible enthusiasm and hundreds of thousands of new voters who participated in the precinct conventions on March 4th is to count their votes promptly and accurately. 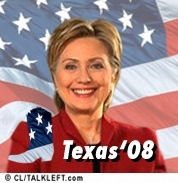 We look forward to continuing to work with the Texas Democratic Party to ensure that happens." There is no plan at this time for the party to provide a statewide count of those regional convention results. There are new articles today in the Dallas News and the Cleveland Plain Dealer on the Republican cross-over vote (Dems for a Day)and whether it had any effect on the outcome. Some Obama supporters would have you believe that it was of such significance as to result in Obama's loss in those states. In Ohio, the article says there were 16,000 cross-over votes in Cuyahoga County (Cleveland.) The article talks about Rush Limbaugh urging Republicans to vote for Hillary, but of those interviewed in the article, one Republican voted for Hillary and one for Obama. They had different opinions on who would be better able to beat McCain. Obama won by 23,000 votes in Cuyahoga. Effect of the cross-over vote on the election: none shown and it's not even determinable which candidate they voted for. Ann Althouse has new information about the dirty tricks I first reported about campaign shenanigans in Tuesday's Texas caucuses. Ann says it's a likely explanation for why Obama is winning in caucus delegates but not in primary votes. Just another reason to avoid caucusing at all cost now. Caucuses can work when they are held as originally intended...for small neighborhood groups of voters to get together in a room and discuss the candidates and policy and then advocate for their choice and vote. They don't work when you have hundreds of people lined up to get in, are limited to designated two hour period and descend into chaos. The caucuses I attended this year in Iowa and Denver were chaotic. Texas sounds worse. I hope the Dems learn from this experience. Only 5% in, with Obama at 56% and Hillary 44%. I'm just looking for Hillary to win the popular vote. That will give her superdelegates a reason to stay with her. If Obama loses Texas and Ohio, in the popular vote, many Democrats will begin to question whether he can win the big states, especially Ohio, to beat John McCain. I'm not that interested in the caucuses. I think it's very likely the superdelegates will be deciding this race. Ill be updating this primary vote thread, but here's a place for you to comment on them. Hillary Wins Texas says CNN and NBC. Listen to the whining from NBC. BTW, you are hearing a lot about Florida and Michigan again. Told you so. Oh and there is no doubt now that the ticket will be Obama-Clinton or Clinton-Obama. Update (TL): Congratulations, Hillary. And I'm not convinced the ticket will be Hillary-Obama or vice-versa. Comments over 200, this thread is now closed. New ones are up. Obama is in San Antonio, a city he didn't win. I wonder why he picked it to spend tonight. He says we may not know the Texas results until tomorrow. He congratulates Hillary on Rhode Island and says while there are a lot of votes out in Ohio, she "apparently" won there. We have the same delegate lead we had this morning and we are on our way to winning the nomination. "Si se puede." Decades ago as a community organizer........ (again?) Talks about youth, a reason to believe, inspire the nation to come together, we are turning the page, we are ready to write the next chapter. Update: Hillary wins Texas. New thread here. This one is closing. Update: It's now 66% and Hillary has a 55,000 vote lead. Update: 55% of vote is in, Hillary leads by 55,000 votes. Okay, it's down to Texas. 50% of the primary vote is in, and Hillary is ahead. She leads by 30,000 votes. Hillary has swept through rural Texas. Obama has Dallas and Houston, but she has San Antonio by 12%. She'll also take El Paso and the South. Update (TL): Hillary now leads in Texas by 1,800 votes. All the commenters agree, whatever happens in Texas tonight, Hillary will stay in until Pennsylvania. She has the momentum now. Most of those deciding who to vote for in the last three days picked her. She's got 2/3 of the Latino vote, which makes up 1/3 of all Texas voters. Update: (TL)Comments now closed here. We're not quite at half-time, but who do you think will win Ohio and Texas now? And what about the lawsuits? Barack Obama sued to reopen some polls in Cleveland, and Hillary reportedly held a media call about suing over voter intimidation in Texas. Ohio's polls close in 30 minutes. Big Tent Democrat and I will be live-blogging the results and other election news coverage. We'll start when the polls close. I'll be putting up some polls up. Big Tent's posts will say BTD and mine will be TL. If comments hit 200, we'll start a new one. Update: Looks like the 3 am ad worked, Texas voters said Hillary is more able to keep our country secure according to CNN. Big Tent has a first exit poll thread about the Independent vote here. Hillary Clinton holds a two-to-one advantage over Barack Obama with Hispanic voters in Texas, while blacks are overwhelmingly supporting him in Tuesday’s Democratic presidential primary, according to CNN’s exit poll. These early surveys provide a snapshot of the race, but are not conclusive on who will win this critical contest. Eighty three percent of blacks voted for Obama, while 16 percent supported Clinton, according to the exit poll. Meanwhile, 64 percent of Hispanics backed Clinton, while 32 percent went for Obama. Update [2008-3-4 18:27:40 by Big Tent Democrat]: Conflicting exit polls -Marc Ambinder sez Clinton with "slim leads" in Ohio and Texas. NRO has two conflicting exits (meaning? trust neither?) 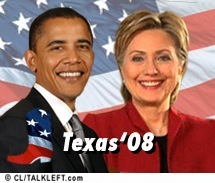 - one has Obama winning both by 2, the other with Clinton up 2 in Ohio and tied in Texas. I'm going to take a break here for a spell. We're a few hours from exit polls and results. How are you feeling about the candidates' chances? Have you changed your predictions since this morning? What's making you most nervous? I'll also put up a Media Horse's A*s thread around 7pm ET for you to rant about your least favorite anchors and pundits. See you soon and yes, we'll be covering the results through the evening. I hope you'll join us. Those threads will open with all election-related comments welcome. Bump and Update: The Texas Democratic Party sent out this directive (pdf)to both campaigns this afternoon cautioning against what I reported below. So they obviously heard it too, although the letter went to both campaigns, not just Obama's. Campaign workers, volunteers and/or supporters have obtained copies of blank sign-in sheets for precinct conventions and are having them filed in now with the desire of turning them in once the convention gets underway. These sign-in sheets are invalid and will not be considered in determining the allocation of delegates. See Tex. Dem. Pty. Rule. IV(B)(6). Update: The Austin Statesman is now reporting on the alleged violations, without specifying which campaign is complaining or allegedly violating the rules. I went to vote this morning in the Meyerland/Bellaire area of Houston. (The area has a real mix of people - different ages, races - and is very much a middle to middle-upper income.) When I left, I was stopped and asked to participate in an exit poll survey sponsored by all of the networks and major papers. This is the first time I've ever been asked to do this. As I entered my polling place wearing a Clinton button, Obama's supporters (about 6 of them) literally gave me dirty looks and turned their back on me. Other voters were greated with hellos, good mornings, and hope you'll vote for Obama. The attitude of Obama's campaigners to me was rather nasty. It was a real turn-off to me, and if he's the nominee, I'll really have to think twice about voting in the general election. Other information: At my polling place there were TONS of Obama signs all over the place, not a single Clinton sign. As I mentioned, about 6 Obama people outside, not a single Clinton person. Inside the polling place, it looked like 2 of the 10 or so machines were off-line (a tech was there working on them), but there was no wait. (A precinct judge said it was very busy at 7am).